pseudoparanormal: To see or not to see, that is the question? On February 2nd of each year, we rely on a groundhog named Punxsutawney Phil to tell us the prospects of the remaining winter weeks. 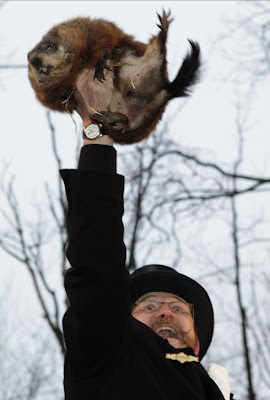 Phil is from Punxsutawney, Pennsylvania and every year people gather around to observe if he is going to see his shadow or not. Phil predicts that if he sees his shadow there will be six more weeks of winter, and that if he does not see his shadow, spring will arrive early. Groundhog Day originally began with Pennsylvania's earliest settlers from Germany who brought with them the tale of Candlemas Day. The Germans stated “For as the sun shines on Candlemas Day, So far will the snow swirl until the May”. To make the story that a groundhog can predict weather even more believable, after Phil comes out from his burrow he tells the Groundhog Club president in "Groundhogese", which is a language understood only by the current president of the Inner Circle, the weather prediction who then translates it for the world. Also noteworthy is that a normal groundhog’s life expectancy is six years in the wild, but Punxsutawney Phil has been kicking around for over one hundred and twenty years! His extended life expectancy is because every summer he takes a sip of the magical Groundhog Punch which lengthens his life for seven years! Now that we understand the overall purpose of Groundhog Day, let me tell you that according to the official Groundhog Day website, groundhog.org, they declare that Phil is correct 100% of the time! A study on weather was done throughout 13 cities in Canada over the past thirty to forty years, and they have experienced an equal number of sunny and cloudy days. Statistically they figured out that 33% accuracy can occur by chance, which makes Phil’s 37% accuracy not significant. Also according to StormFax Weather Almanac, Phil has only been accurate 39% of the time. Both of these percentages are not very high for Punxsutawney Phil, so why do you think after all this time we believe the magic and we still look to see whether he will wake up in the morning to find his shadow? I don't believe that a ground hog can really tell us that winter will last longer or spring will come early.